The exotic location of Jodhpur attracts innumerable tourists round the year. Soaked in heritage and royalty, palaces and mansions flood the city, giving a vivid spectacle of the royal dynasties that ruled the place during medieval times. Some dynasties have left a royal insignia and their architecture tells the heroic tales of their rule till date. The Umaid Bhavan Palace is one such landmark. Acclaimed as one of the world's largest private residences, the palace has been awarded the title of World's Best Hotel at the Traveller's Choice Awards. Initially built by Maharaja Umaid Singh, the place now hosts the present royal family. A section of the palace is managed by the Taj Hotels and another wing houses a museum displaying the vivid royal insignia. The history of the palace is dated back to 1928, when Jodhpur was in the grief of a severe famine. In order to provide the needy section of the starving population with work, the then Rathore ruler of Marwar, Raja Umaid Singh, commissioned the construction of the palace. Since then it has been the official residence of the royal family. 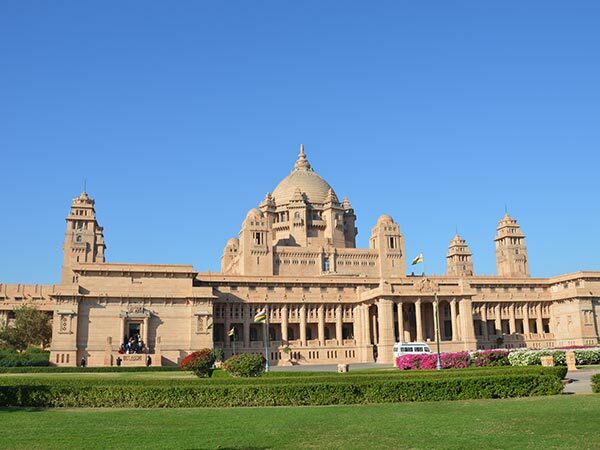 Umaid Bhawan Palace is situated on Chittar hills on the outskirts of Jodhpur. The magnificent palace is built with golden-yellow sandstone, Makrana marble, which reflects the marvel of architecture soaked in history. The interior wooden works boast of Burmese wood, intricately carved out into perfection. The palace design is referred to as the Beaux-Arts style. It is the official residence of the royal family, who has converted a section of the palace into a hotel. The current royal heir residing there is Raja Gaj Singh. Evening lights illuminate the entire palace into a royal durbar and it is worth watching the cultural reflections of the palace through the local artists performing nearby. The vintage car collection of the maharaja is also well-acclaimed and is a must-watch. The lavishness of the palace can be reflected in its durbar hall, banquet hall, ballroom, library, throne chamber, indoor pool and spa along with every other modern facility. There is a central dome above the inner sky-blue dome and this inner vaulted dome forms a major attraction. The lobby is polished with black granite flooring and the lounge is built with pink sandstone. The palace architecture is said to be a combination of Western Art Deco style along with Indo-Saracenic revival. The museum houses exhibits of stuffed leopards and an impressive banner, which was a gift to Maharaja Jaswant Singh by the queen of England. It also hosts collections of clocks, inner photographs, memorabilia, glasswares and all information related to the palace. The durbar hall of the museum hosts fine mural paintings and the compound showcases vintage cars of the palace. Winters are the best time to visit the palace as the climate is cool and comforting. October to March is the best time one can arrive here. By Air - The nearest airport is Jodhpur located just 3 km from the palace. The airport connects all the major cities of India. By Rail - Jodhpur station is located at a distance of 5 km and is well connected with all major routes of the country. By Road - Rajasthan state buses operate to connect all major cities including Bikaner and Jaipur.